Our first day with the Cain family from Texas was one full of adventure and history. After their grueling flight from America on Delta Airlines, which consisted of one broken plane in Atlanta, then finally a 777 was found “in a hanger somewhere” which took more than six hours to be readied for flight, our two-time repeat clients arrived at Rome’s International Airport 11 hours after planned arrival but at least pretty well rested thanks to the lay flat beds on the 777. 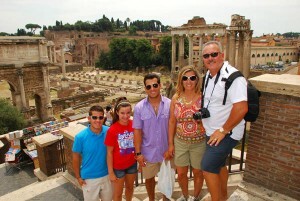 They left 105 degrees fahrenheit in Texas to come to 82 degrees in Rome. A nice little change in temerature. A huge change in history and architecture and surroundings. Melissa Cain had the first gelato of her life today in Rome. We drove into central Rome, washed up and hit the nearby Trattoria “Perilli” for dinner of spaghetti carbonara and yes, rabbit, served in a lemon sauce and pronounced excellent by all. Rabbit is a main dish in these parts. 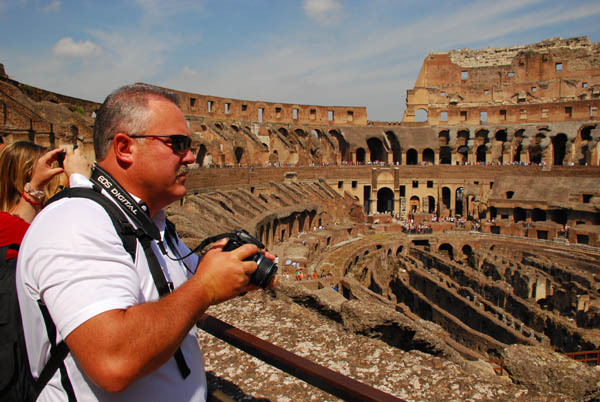 On their second day, July 4, we hit the ground running and toured the Colosseum, the Palatine Hill and remains of Rome’s upper class homes, the Roman Forum and the Pantheon along with the Trevi Fountain and the Spanish Steps. 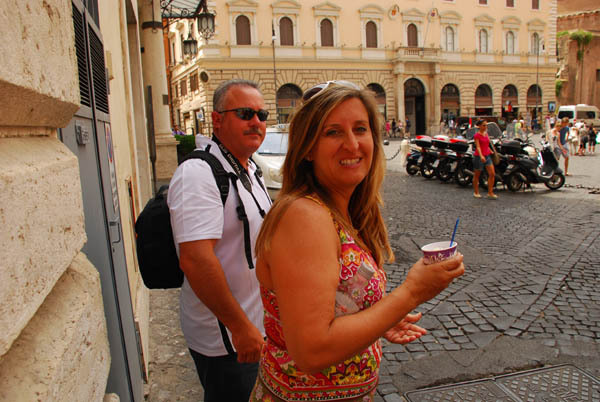 Along the way, Melissa had her very first taste of gelato! This is a life-changing experience for most. It’s hard to believe that the engineering that went into the Pantheon and the Coliseum was an art lost for centuries during the Dark Ages. What happened to all that “know how?” When empires fall, and the Roman Empire fell hard and fast, there is a tremendous loss of creativity, knowledge and advances. How did they manage to build this amazing structure in 70 AD? And, in just ten years? Dennis Cain surveys the Coliseum. Morgan buys a "squishy thing" near the Spanish Steps. Posted in Italy Tours and tagged rome, spanish steps.